A dimly lit dining room, 1970’s furniture, hustling staff and bustling patrons. This is not a restaurant, this is a Supper Club. Treasure Island is everything you could ask for in an old school eatery. Located in the heart of Moraine, Ohio, it has great service, great food and classic ambiance. This place is like a scene out of the movies “Saturday Night Fever” or “Looking for Mr Goodbar.” When you enter Treasure Island Supper Club, the carpeted lobby has a metal railing staircase that leads to bathrooms and a party room on the second level. What other place has that? But it doesn’t end there, we are just getting started. As you pass from the lobby into the eating area, you notice a room with lighting so low that you cannot tell if it is noon or midnight. The bar area is a low seat bar with the bartender working in a “pit” even lower than the bar patrons. The bar is adjacent to a walkway that leads to the dining room. The walkway is lined with wooden spindles that were hand carved by the restaurant owner. In fact his woodwork is throughout the supper club. We were expecting to hear “bow chicka wow wow” music, but that did not happen. A hostess greets you near the walkway and puts you on the waiting list, or seats you promptly. You will be seated in a leather 70’s style booth or some old school table and chairs. Even the water glasses are old school, and we love it ! On the table in a wicker basket, are various types of Lance crackers and butter packets. We ate a lot of melba toasts, crackers and captain’s wafers leaving our table strewn with Lance cracker wrappers. Our Food Adventure Crew lives for unique places like this. Our server who waited on us was fantastic. She was a throwback to the days when waitresses were career waitresses for decades at the same restaurant. 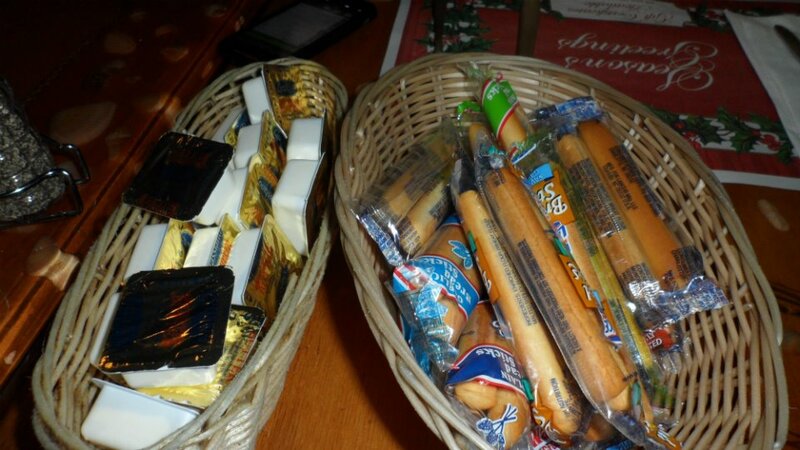 She brought our salads and a basket of poppy seed bread that was still warm, so we put the butter packets to good use. We were then served a shrimp cocktail appetizer that stayed in theme with the 70’s nostalgia. 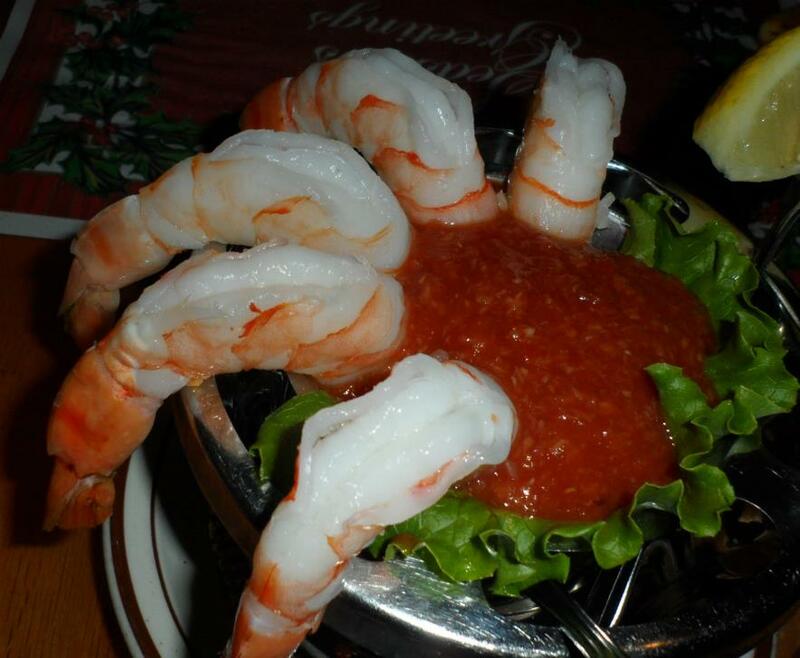 The huge shrimp were served in a silver goblet lined with green decorative lettuce. the shrimp were already partially dipped in the cocktail sauce inside the goblet. These were some of the largest and best tasting shrimp we have ever eaten. Make sure you don’t miss out on this old school shrimp cocktail or you will be squirming in your red leather chair. We saw a customer being served a large corn fritter that looked good, so we decided to order one too… good move. The homemade, handmade corn fritter is served with maple syrup packets and simply melt in your mouth. We sat their enjoying the appetizer feeling like we were in an episode of “Starsky and Hutch.” The fritter was cooked perfectly, nice and moist on the inside and golden brown on the outside. In the restaurant lighting it looked like a brick of gold from Fort Knox. After stuffing ourselves with crackers, bread, butter, salad and appetizers, our main entrees arrived. One of us had ordered the baked halibut dinner. It was served old school style with dunking butter! It also came with a baked potato, decorative parsley, and large sides of butter and sour cream. Again 70’s additude toward cholesterol and fat! 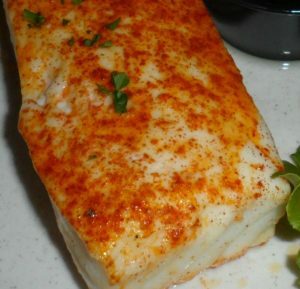 The fish was firm yet fluffy and absolutely delicious. The baked potato was perfectly cooked as well. The Big Ragu’s entree was the seafood platter. How old school is the name of that dish? The dinner was served with frog legs, fried shrimp, crab cakes, fried scallops, and fried oysters. The dinner was very rich, but tasted incredible. It was served with a side of hash browns that didn’t disappoint. After finishing our meal, we thanked our waitress and the assertive busboys. As we walked out of the restaurant we joked about coming back for a picture outside the restaurant dressed in 7o’s Afro wig, terrycloth shorts, and pulled up white socks with stripes. It was another successful Food Adventure! Our visit here was fantastic, truly enjoy Treasure Island Supper Club and had one of our better Food Adventures here. If you have not been here to try the great food you are missing out on a taste bud experience! It is a fun place to dine with some of the tables hollowed out with golf or Vegas decor behind tabletop glass. The Big Ragu and Crew highly recommend that you visit Treasure Island because they do things right, and have not changed their successful formula. The simplicity of good food and good service is timeless, no matter what the decade. If you visit this supper club and you see a couple of guys with cheesy 70’s mustaches, or Dirk Diggler haircuts, it just may be your Food Adventures Crew and the Big Ragu, incognito! “Like”Food Adventures on Facebook by clicking here! 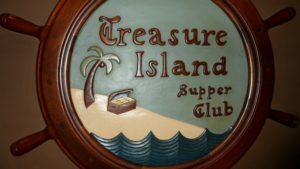 Have you been to Treasure Island Supper Club? If so, did you get your 70’s groove on at this phenomenal spot? Please leave your comments below ! 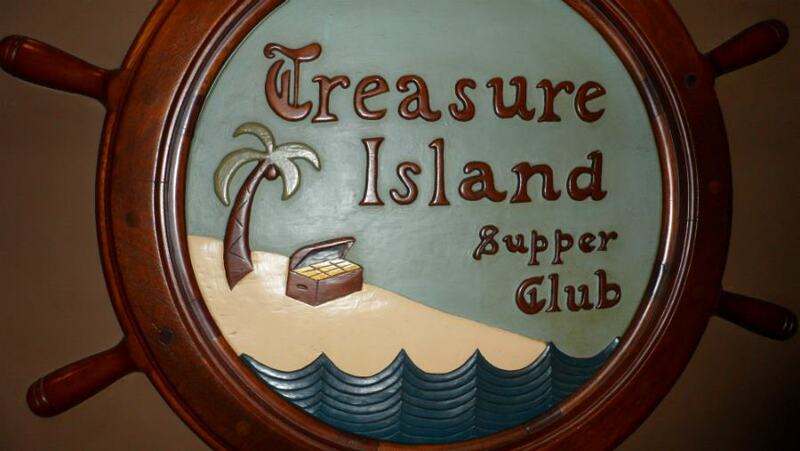 Treasure Island’s menus for lunch and dinner may be viewed by clicking HERE.